I don't read a lot of horror fiction, but I do occasionally check out the "creepypasta" stories that people publish online, some of which are very effective with the scares. So I was glad to get the chance to read this upcoming horror novel by an author who gained his fame through the online horror story Penpal. However, I ended up being not especially satisfied with the actual book (I didn't like Penpal very much either, for that matter). Perhaps it's just my own tastes, but I felt like this one took much too long to get to where it was going, focusing more on the main character's turbulent emotions than on any spookiness that was going on around him. The problem might be my own expectations; I thought this might be something of a supernatural story, but it turns out to be fairly grounded, although I wouldn't exactly call it realistic. 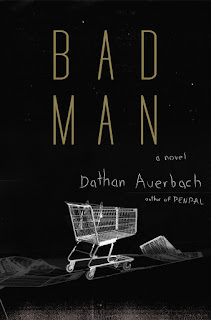 The plot involves a young man named Ben whose three-year-old brother disappeared without a trace while the two of them were at a neighborhood grocery store. In the five years since the incident, he has been wracked with guilt and searched everywhere in town to find his brother, to no avail. 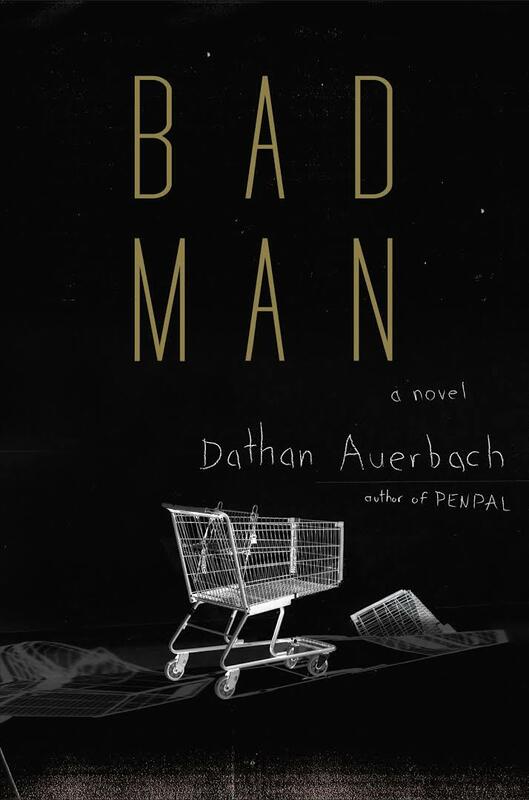 After he graduates from high school, he looks for work to help his family make ends meet, but the only place in his small town that is hiring is the store where his brother disappeared. So, he ends up working the night shift, and some strange stuff seems to be going on around the store, although less than one would expect in a book that's supposed to be scary. Instead, the focus is mostly on Ben's emotional state, including his continuing guilt, anger, and desperation, as well as his inability to trust anyone else. He's a complicated character, and not especially likable, prone to lashing out at people who care about him, obsessing about whether others are lying to him, and suspecting that nearly everyone around him is either involved in his brother's disappearance or just doesn't care enough to help find him. 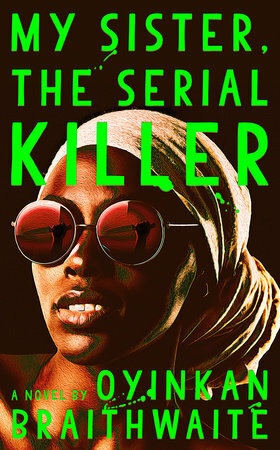 I think that's the real focus of the book, and rather than going for scares, the kind of horror the author seems to be attempting is placing the reader in an unpleasant headspace. I wouldn't exactly call Ben an unreliable narrator, but you do get the idea that his internal sense of himself is different from what others see. 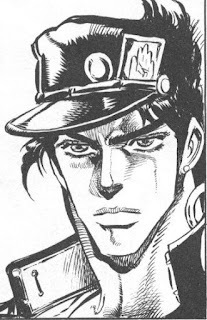 He seems to think he's on a heroic crusade to find his lost brother, while he's actually causing a lot of pain to those around him and generally making things worse. 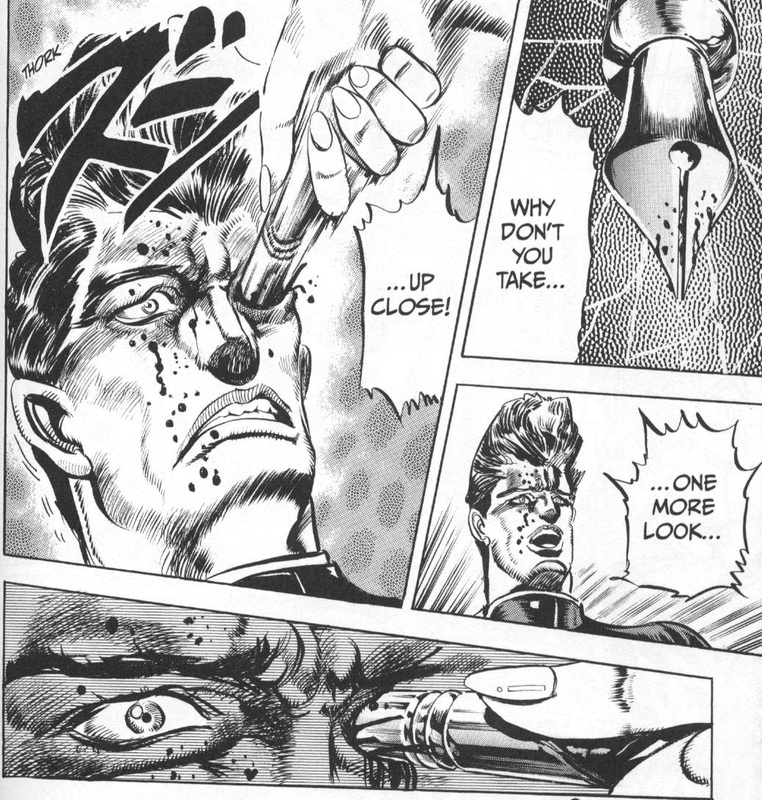 And that makes what ultimately happens to him kind of fitting, if still pretty disturbing. All in all, it's an interesting book that's fairly effective in placing the reader someplace they don't really want to be. It does take a long time for things to happen, but maybe that's by design too; Ben has been waiting for answers for five years, and he's stuck eking out a grim existence, with little hope for the future. Things are already sad enough at the start, and they just get worse, no matter how hard the characters try to make things better. In that way, it's kind of a fitting book for modern times. That doesn't make it especially satisfying or enjoyable to read though. JoJo's Bizarre Adventure: The series gets...less bizarre? 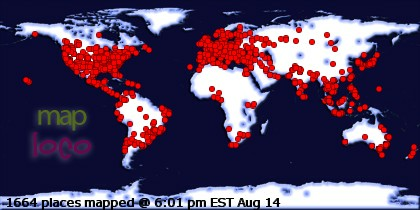 This blog isn't dead if I publish one or two blogs a year, right? If the first two parts of JoJo's Bizarre Adventure were ludicrously over the top examples of shonen fighting manga, this third volume seems to be the point at which creator Hirohiko Araki toned things down a bit and settled into a long-running quest storyline. 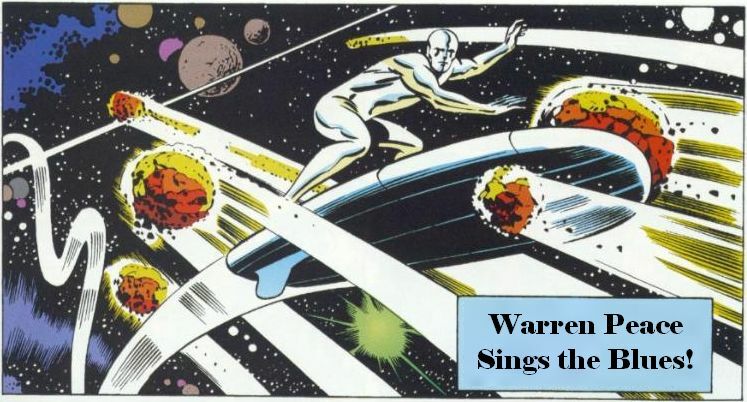 They're still pretty weird, with lots of striking gore, strange fashions, and nonsensical superpowers, but not quite at the level of what he had exhibited previously. Maybe setting the story in the present day somehow made things more restrictive, as if there needed to be at least some semblance to reality? This is kind of a clever way of introducing the series' latest twist on crazy superpowers. You see, certain people have such powerful life energy that it creates an apparition expressing their inner nature or something. Since these spirit figures stand next to them, they are known as "stands," which I suspect is a case of a Japanese creator using an English word that sounded cool to them but comes off as awkward in translation. 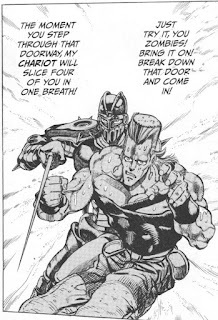 Anyway, only stand users can see each other's stands, and both Jotaro and Joseph have had their stands recently awakened due to the reappearance of an old enemy: Dio! 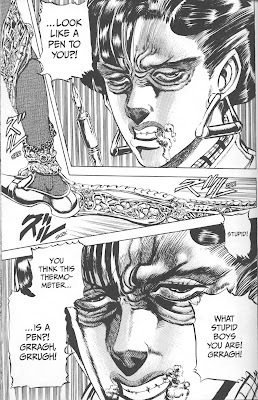 That's right, the villain from part 1 has been awakened after somebody found his body on the bottom of the ocean, and what's worse is, his head (which, you may remember, was all that was left of him after a series of epic battles) is wearing the body of Jonathan, Joseph's grandfather! Gross! But after Jotaro removes the flesh bud via awesomeness, Kikyoin is eager to join the gang on their quest. However, they quickly learn that their journey to Egypt won't be so easy when another bad guy attacks their plane and causes them to crash. In order to avoid endangering innocent bystanders in future attacks (and to provide a reason for a road-trip narrative), they decide to take a more roundabout route, traveling by sea and land throughout southern Asia. 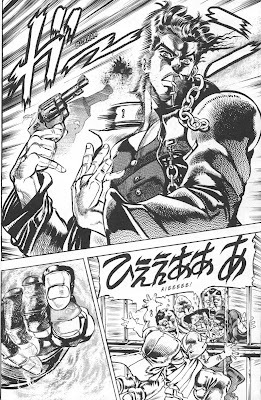 They do manage to fill out their ranks a bit more after encountering a Frenchman named Jean Pierre Polnareff in Hong Kong. 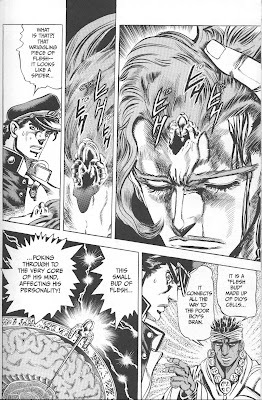 As with Kikyoin, he attacks them because he's being controlled by Dio, but his sense of honor fights through his evil programming as he accepts a noble death by fire at the hands of Avdol's flame-controlling stand, which makes them decide to spare his life and let him join the team. 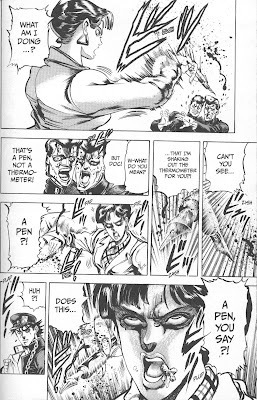 That might just be Araki inserting some of his general oddball sensibility into the story, which he does take the opportunity to do whenever he gets the chance, although if anything, he seems to have toned things down a bit. This turns out to be a fairly conventional shonen narrative involving a group of awesomely-powered pals (some of whom started out as bad guys) traveling together and occasionally fighting evil on their way to confront the ultimate villain. 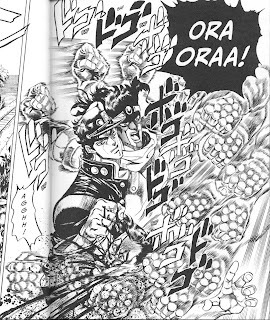 The sheer level of anything-can-happen strangeness is not as prevalent here as it was in previous volumes, with villains mostly being defeated after being overpowered (Jotaro's main attack seems to be a flurry of punches) or occasionally outsmarted through teamwork. It's kind of disappointing; there's not much of the one-upmanship that I enjoyed so much in previous parts, with combatants countering their opponents moves through secret techniques only to fall prey to counter-counter moves, which are countered themselves in increasingly awesome and unlikely ways. But maybe that sort of storytelling isn't sustainable; if every encounter is more awesome than the last, you eventually reach a point in which you can't get any more awesome (although I could think of a few rebuttals to that idea, such as the Dragon Ball manga or the anime Gurren Lagann). 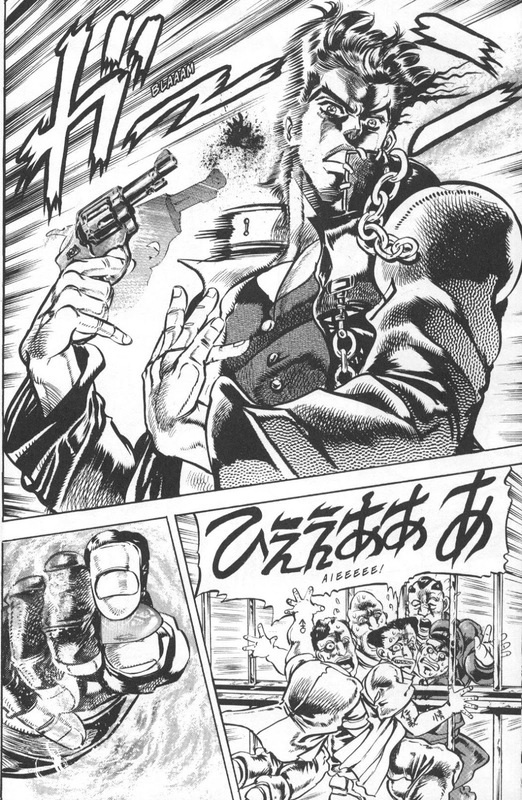 For a longer-running series, shorter encounters with secondary bad guys makes for an easier hook, and maybe Araki can pull out all the stops when the gang finally gets to Dio himself. And who knows, after that the sky's the limit. 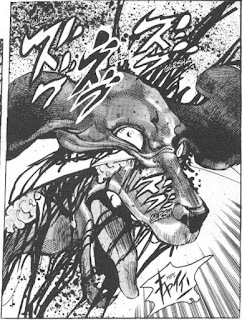 But for what actually does occur here, there's plenty of strangeness, imagination, and lots of the series' trademark gore. 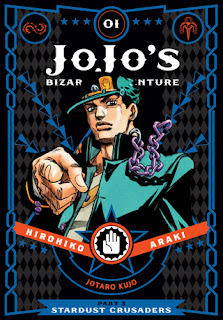 Also, Araki has given himself an interesting foundation to build the series on by basing everyone's stand on cards from the Tarot deck. 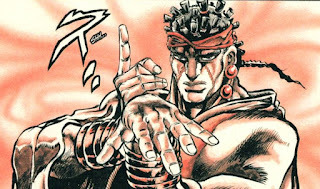 They start out by pairing cards with a color; Avdol's stand is named Magician's Red, Joseph's is Hermit Purple, Kikyoin's is Hierophant Green, Jonathan's is Star Platinum, and so on. 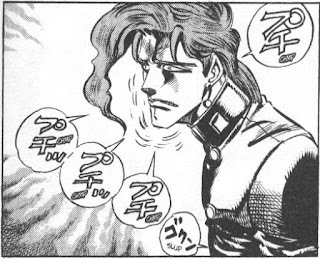 Later, Araki drops the colors and just names stands after the cards, so they encounter Emperor, Hanged Man, The Lovers, Justice, The High Priestess, etc. 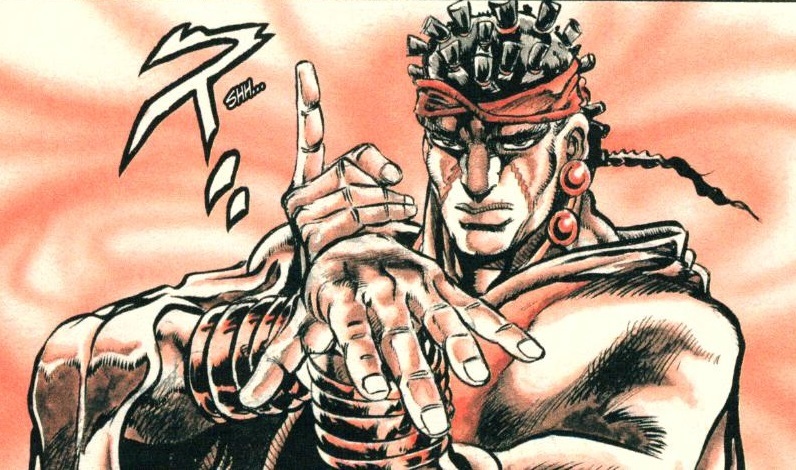 It sort of makes sense, at least early on, with Avdol, a fortune teller, remarking on what the different cards represent and how the stand users' powers fit that theme. But eventually it just seems to be an idea generation machine, with the names of cards giving Araki an excuse to draw whatever seems to fit the theme. 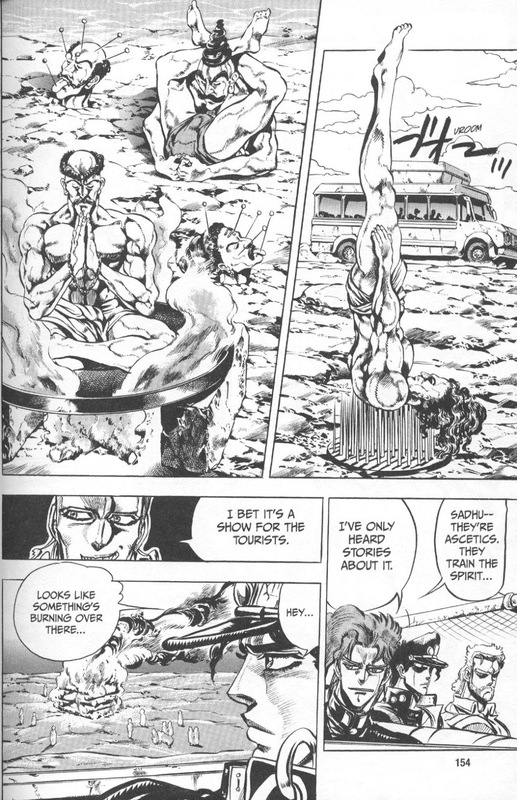 And eventually, Araki runs out of Tarot cards, so when the gang gets to Egypt, they start encountering stands based on the Egyptian pantheon of gods (some lip service to consistency is paid when a character claims that Egypt is the origin of the Tarot, which is a notion that seems suspect). And there are certainly some crazy/cool ideas here, as well as quite a few that don't make a whole lot of sense, but you just kind of have to accept them. 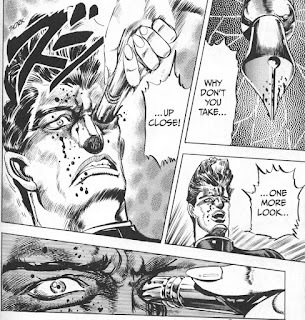 Joseph's stand takes the form of thorny vines that come out of his hands, but he mostly uses them to interface with electronic or photographic equipment for remote viewing purposes (including karate chopping and smashing a Polaroid camera in order to generate a picture of Dio). Polnareff's Silver Chariot stand is an armor-wearing swordsman that moves so fast that Avdol's stand's flame powers are useless against him because "My stand can freely slice apart flames and separate them...creating gaps between pockets of air, guiding the fire." Uh...sure, that makes sense, I suppose. And those are just the main characters. 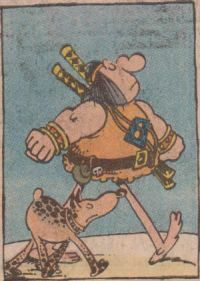 The villains consist of a motley assortment of freaks and weirdos, mostly recognizable by their grotesque appearances. There's a serial killer whose stand attacks people through reflections, a sadomasochistic creep whose stand seems to be inspired by the killer doll from the movie Trilogy of Terror, a womanizing cowboy with a gun stand that fires ghost bullets, a gross old lady who turns people into zombies/puppets after punching holes through their bodies, a guy who shrinks his stand down to microscopic size to attack people from inside their brains, and a baby stand user who attacks people through their dreams. And those are the fairly normal ones! 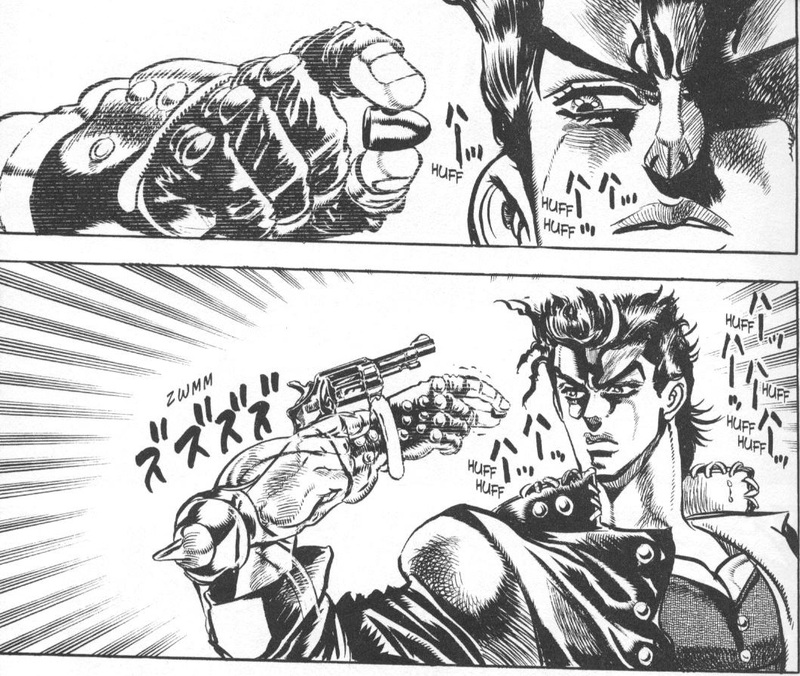 This phenomenon of "normal people" being able to see and interact with stands happens more than once, and it usually gets hand-waved away. 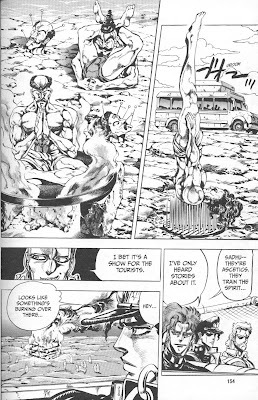 There's another guy whose stand is an amorphous, shape-shifting blob which he uses to disguise himself as other people, and apparently his stand is able to take physical form because that was what the plot called for. Later, the crew fights against a stand that takes the form of a sword that possesses anyone who unsheathes it, which kind of upends the whole basis of the series' mythology. Ah well, you can't really take points off a series like this for being unrealistic. So, overall, this is still a pretty enjoyable series, even if it has lost some of the batshit craziness of earlier volumes. 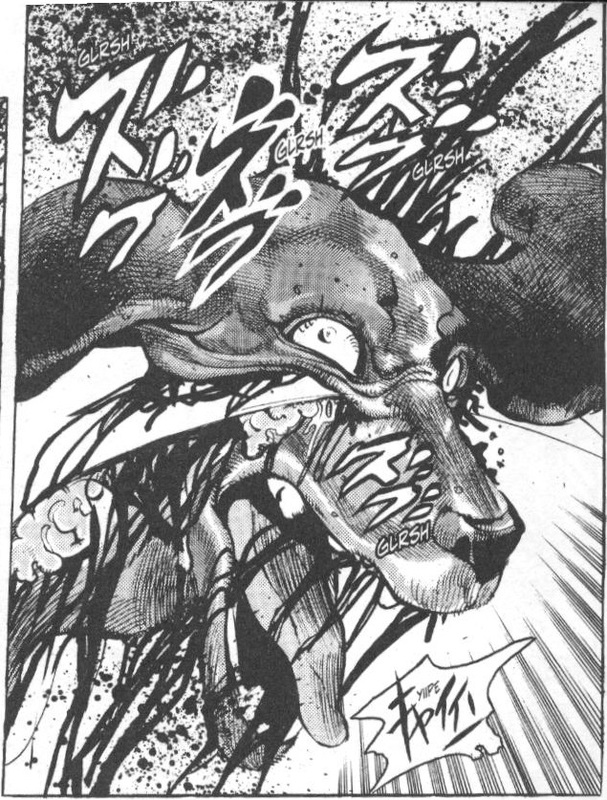 I'm definitely curious to see what other types of superpowers and gore that Araki can come up with, and who knows, maybe he'll pull out some sort of insane battle that tops everything he's done so far. Here's hoping for as much nonsense and, yes, bizarreness as possible.